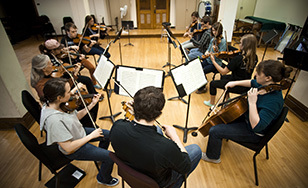 St. Scholastica's String Orchestra and chamber ensembles will be "Bringing in the May" at their last performance of the season, at 7:30 p.m. Tuesday, May 1 in the Mitchell Auditorium on campus. Ancient Celts celebrated May Day by gathering flowers from woods and fields and bringing them indoors, which they called "bringing in the May." In place of flowers, the ensembles will offer a musical bouquet gathered from the chamber music repertoire for string, bass, and wind instruments. The concert will highlight St. Scholastica's String Orchestra, performing a wide range of pieces from as early as the late Renaissance with "The Leaves Be Green" by William Bird, to as modern as the "Game of Thrones" theme song. Graduating seniors violinist Aaron Wilcox and cellist Caitlin Olsen will each perform solos. The Brass Quintet will also make an appearance, performing music by late Renaissance composer Giovanni Gabrieli and 17th-century composer Johann Pezel. This concert is general admission, with first-come, first served seating. Tickets are $5 (free for students) and will be available at the door before the concert.